The industry sector comprises of manufacturing, mining, construction and electricity. 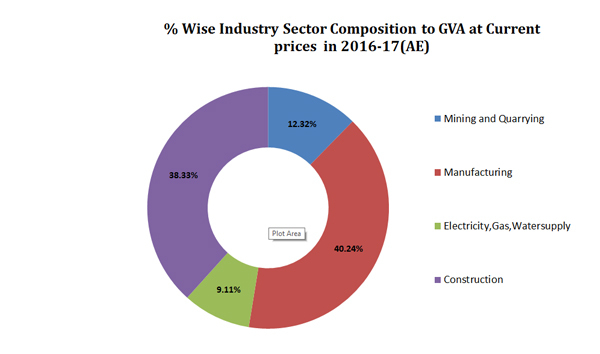 The sector contributed 22.2% to GVA and had a growth rate of 10.16% in FY 2016-17 at current prices. The per capita income in the industries sector is higher than the agricultural sector but lower than the services sector in Andhra Pradesh. Under Vision 2029, it is envisioned to position Andhra Pradesh as a leading state in industries to enable value driven growth, local job creation and market oriented products. The vision to achieve a sustainable economic transformation can be realized only with a structurally strong, technically efficient and economically inclusive manufacturing sector. The state has critically identified the challenges faced by the sector; and in response to these challenges it has chalked out the theme based strategic roadmaps. Further, the state has also listed down strategy specific and action oriented KPIs (Key Performance Indicators) of Industry Sector to achieve the vision. AP currently ranks 51st (against India’s 56th rank) out of 141 economies on the Global Competitiveness Index, and aims to be amongst the top 25 by 2029. AP ranks 1st in India according to the DIPP study on implementation of Business reforms 2016 for Ease of Doing Business. The state aims to become one amongst the three best states in India by 2022, the best state by 2029 and a leading global investment destination by 2050.